Prefab Office Structure – Abtech, Inc.
Prefab offices may be delivered in numerous completed parts or as one completed piece. Prefab offices are often of a steel welded construction, which allows for nearly endless design styles, sizes, shapes and the ability of fast relocation. Prefab offices are popular for their functionality, fast installation, various design possibilities and reusable materials. They can be used as temporary spaces, overflow areas and permanent workspaces. They may even be temporary walls and structures within a permanent office space, or they may function as add-ons attached to permanent structures. 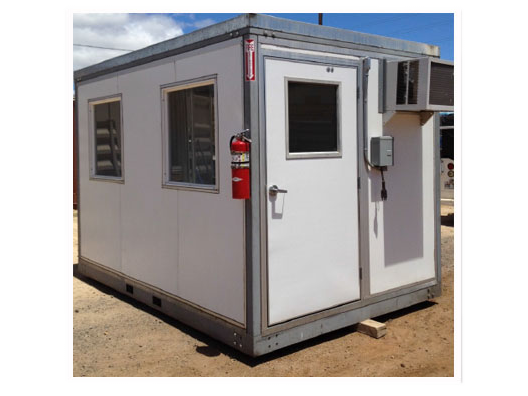 They often function in a temporary setting as offices used at construction sites or as offices or triage stations at disaster sites. 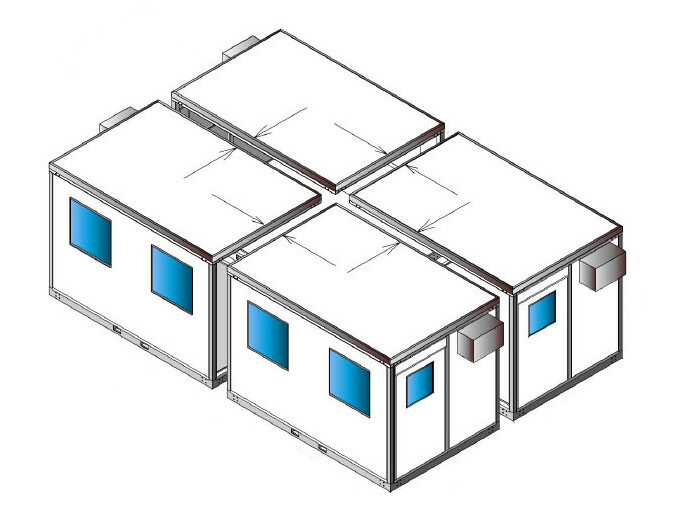 Prefab Qube-System Offices – Abtech, Inc.
Prefab offices that take on a more permanent role, such as those used by fledgling small businesses or small practices, can be outfitted with electricity, plumbing and wireless internet capabilities. They may even come with small kitchens. Prefab office walls can be designed in a variety of thicknesses to accommodate various application requirements. They may be additionally customized with insulation for cold or severe weather. Optional door glazings include tinting, laminating, low-e or spandrel glass, unbreakable polycarbonate, impact resistant acrylic sheet and bullet resistant material. Additional office amenities that may be added to a prefab office includes stainless steel or plastic laminate countertops, stainless steel or plastic laminate shelving, extra electrical outlets, surge protected plugs, plug strips, intercoms, locking cash safes, drop safes, time clock alleys, bathrooms and closets. Prefab offices can have all the functionality of a traditionally built office, but with parts prepped on a factory floor and delivered for quick and simple assembly, cutting down on at least half the normal installation time. This causes less disruption to a customer’s daily business operations and eliminates the dust and debris of a normal construction site. Furthermore, if a prefab office user would later like to make changes, it will be as simple as rearranging panels and adding new prefab parts. In this way, prefab offices are less mess and less stress. Prefab Offices Prefab offices are prefabricated, built largely, if not completely, off-site. They serve as office buildings but are not actually connected to a permanent foundation on the ground.